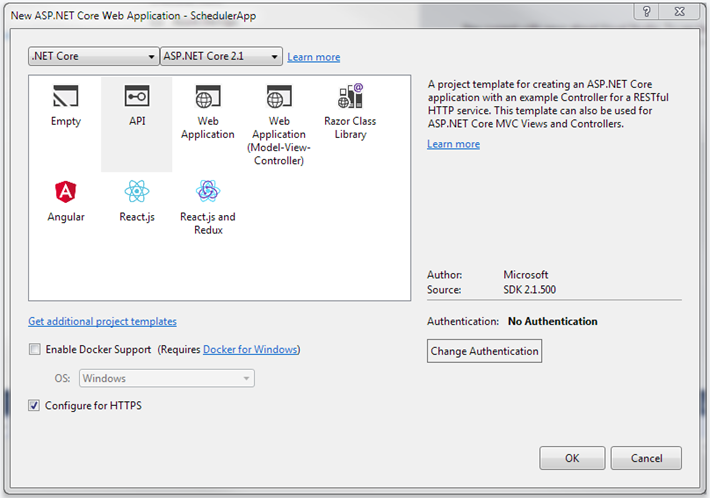 This tutorial gives you step-by-step instructions on how to create Scheduler with ASP.NET Core on the server side. To organize communication with database, the Entity Framework Core is used. The application is built with the help of the Visual Studio 2017. You can check a ready demo on Github. 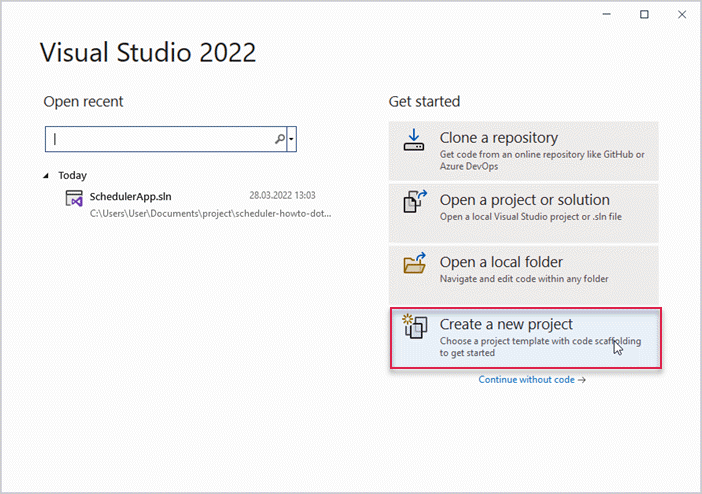 Launch Visual Studio 2017 and create a new project. Open the File menu and select: New -> Project. 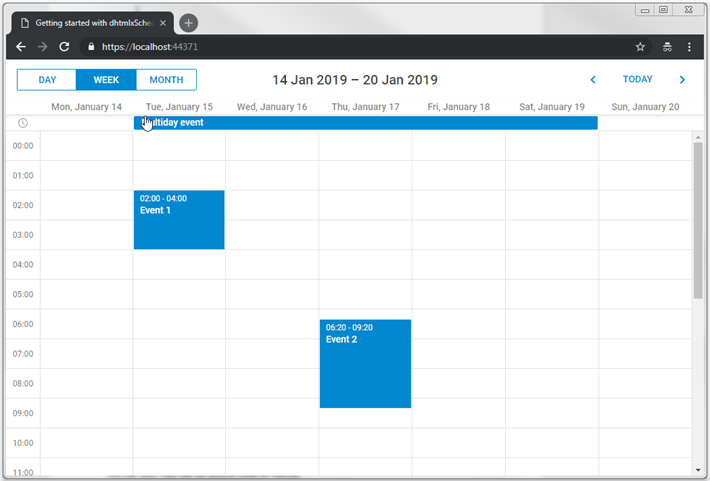 Next select ASP.NET Core Web Application and name it SchedulerApp. Go to wwwroot and create an index.html file. In the newly created file make a simple page for a scheduler chart. Note, that scheduler files are added from CDN in this demo. If you use the Professional version of the component, you'll need to add scheduler files to the project manually. Next go to Startup.cs and tell the application to use the index.html page. In order to do so, we need to configure the app to serve static files from the wwwroot folder. It's done in the Configure method by calling the app.UseStaticFiles() method. You can find more details here. // Use it to add services to the container. // Use it to configure the HTTP request pipeline. default.htm Thus, you can choose any of them, while in this tutorial "index.html" is used. UseDefaultFiles() is just an URL-rewriter that doesn't actually serve the file. For this purpose you need to also add the UseStaticFiles() file. app.UseStaticFiles() – is responsible for serving all static files present in the wwwroot folder. Once you are done with it, an empty scheduler should appear on the page when you run the application. Next steps will show you how to create a backend API and connect scheduler to it. Let's begin with data model. You'll need a class for scheduler events. 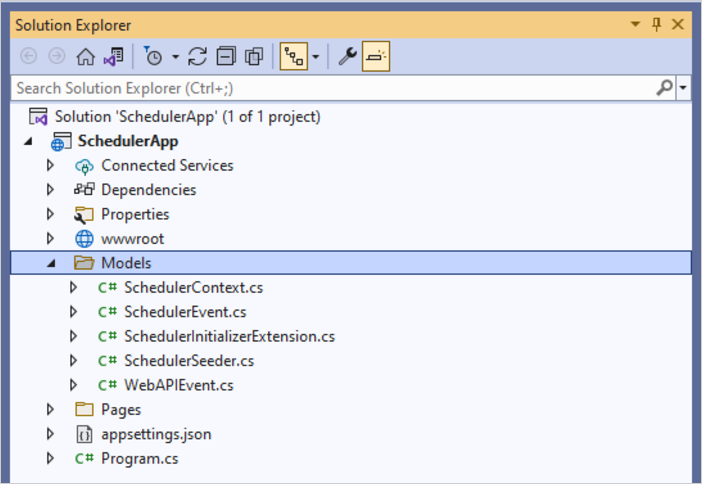 dhtmlxScheduler uses non-conventional names for model properties from the .NET world perspective. DTO classes that will be used to communicate with Web API. Then mapping between the two models should be implemented. 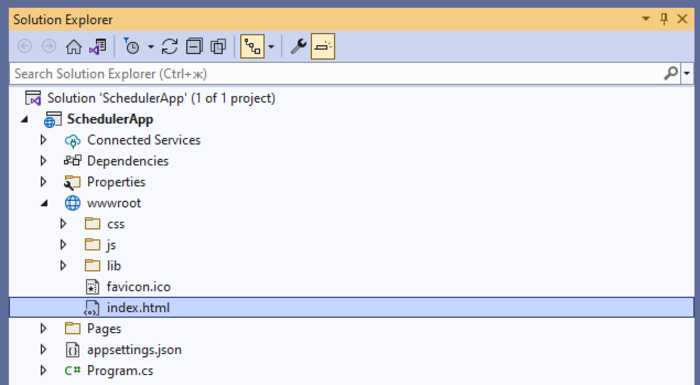 Create a new folder called Models in the project folder. This is where model classes and EF context will be implemented. First, create a class for events of the calendar. Create a file in the Models folder and name it SchedulerEvent.cs. Note, that scheduler events can have all kinds of additional properties, which can be utilized in the calendar. We're showing you the basic stuff here. The Entity Framework Core will be used to manage communication of the app with a database. Now we can add records to the database. Let's create the database initializer that will populate the database with events. In the Models folder define a class and call it SchedulerSeeder. The class will have the Seed() method that will add events and links to the database. Now you should register the database in Startup.cs. But first you need a connection string for it. It will be stored in a JSON file in the application settings. If you used API template when created the project, this file should already exist in project folder. If you used Empty template, you’ll need to create one. After that you can register the database context via dependency injection. //This method is called by the runtime. Use it to add services to the container. //The method is called by the runtime. Use it to configure HTTP request pipeline. Finally, you need to initialize and seed the database on the app startup. Normally, we'd want to use migrations for that, but for simplicity they aren't used here. The current part is finished, let's return to Scheduler. Everything is ready. You can run the application and see the fully-fledged Scheduler. Each time scheduler calls our GET action, it loads the whole events table. It may be ok for a start, but after the app is used for a several months the amount of data transferred will grow dramatically. So it may be worthwhile to implement dynamic loading, which allows scheduler to load only a required events range. 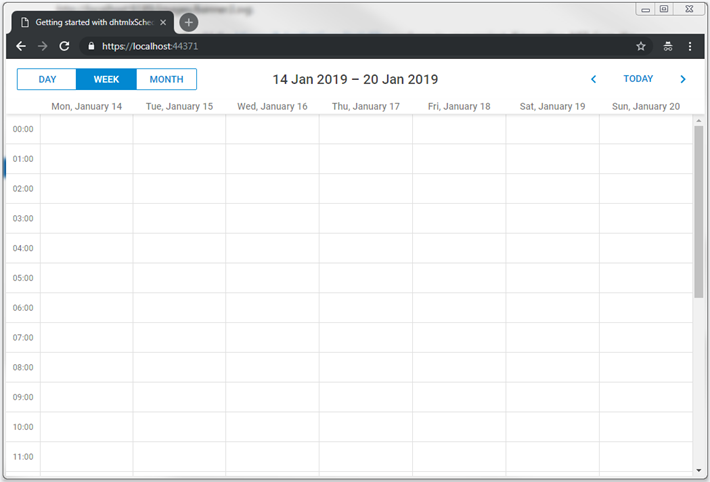 After that scheduler will start adding from and to date parameters to GET requests, so the backend could return only events between these dates. if the event you are going to delete has a non-empty event_pid, it means a user deletes a modified instance of the recurring series. Instead of deleting such a record from the database, you need to give it rec_type='none', in order for scheduler to skip this occurrence. if a user deletes a whole recurring series, you also need to delete all the modified instances of that series. // with rec_type==none instead of deleting. 1. 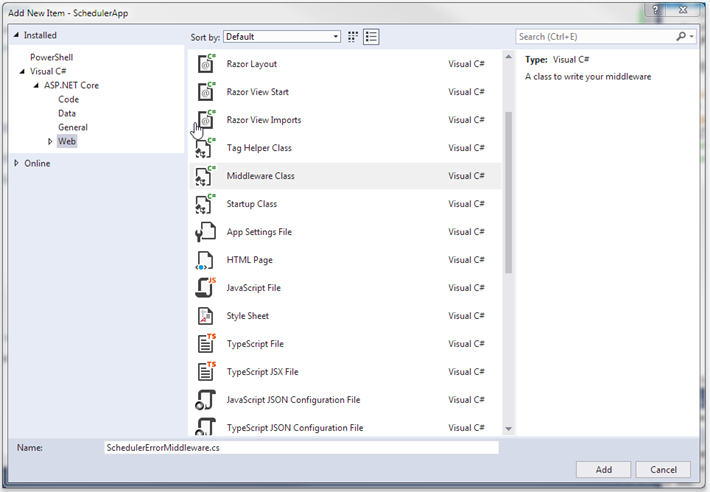 Create a middleware class from a template in the project folder. 2. Find the invoke method and note the _next call. Some handlers can throw exceptions, so let's catch them. Wrap the _next call with a try-catch block and run our handler if an error is captured. The important thing is that you add it before the UseMvc call. Scheduler doesn't provide any means of preventing an application from various threats, such as SQL injections, XSS and CSRF attacks. The responsibility for keeping an application safe is on the developers who implement the backend. Read the details in the corresponding article. A simple solution would be to encode the text properties of data items when we send them to the client side. For example, in the below code a built-in HtmlEncoder is used to escape HTML values in the text of events. That way our database will contain unmodified data, but the client side will receive safe values of event.text. Another approach would be to use a specialized library, e.g. HtmlAgilityPack and completely strip any HTML event when we save/load data. In case you've completed the above steps to implement Scheduler integration with ASP.NET Core, but Scheduler doesn't render events on a page, have a look at the Troubleshooting Backend Integration Issues article. It describes the ways of identifying the roots of the problems.